Composed by Wolfgang Amadeus Mozart (1756-1791). Leduc. Classical. CD. 32 pages. Alphonse Leduc #AL20856. 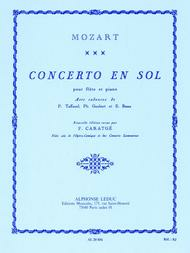 Published by Alphonse Leduc (HL.48181379). “Wolfgang Amadeus Mozart's (1756-1791) Flute Concerto in G was written by the composer in 1778. The Concerto remains widely studied and performed on the Flute, making it one of the most important Concerti in the instrument's repertoire. Concerto in G is in three movements; 1. Allegro maestoso, 2. Adagio ma non troppo, and 3. Rondo: Tempo di Menuetto. The first and last movements are in the tonic key, whilst the second movement is in the subdominant key of D major. A Dutch flautist of the time, Ferdinand de Jean, commissioned Mozart for four Flute quartets and three Flute concerti. However, the composer, who famously disliked the Flute, only completed three quartets and two concertos. Instead of composing a second concerto, Mozart rearranged his Oboe Concerto, with substantial changes for it to fit with the Flute. 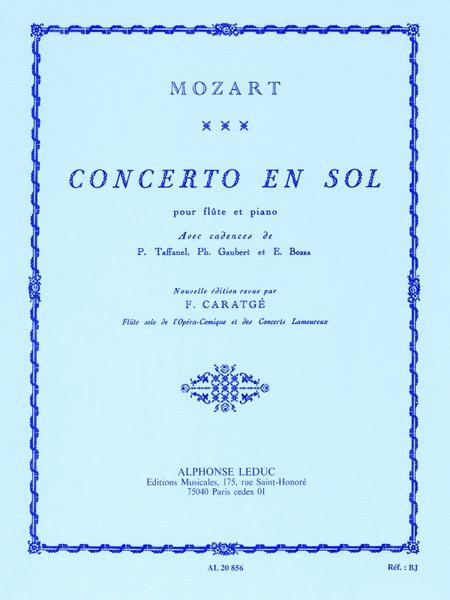 This edition of Mozart's Concerto in G includes cadences by virtuosos Taffanel, Gaubert and Bozza, making for an unmissable version of the famed work. ”.